Everyone expected the big computer crash on december 31st 1999, but it did not happen. Here and there, you could however spot one ore another neat effect. Also in the BMW 850CSi. Normally full centuries are no leap years, every fourth is though (1600, 2000, ...). Something must have gone wrong programming the on-board computer. 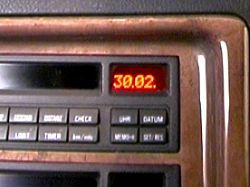 While february 29th 2000 was displayed correctly, on march 1st it showed february 30th. From the following day on (march 2nd) the date was correct again - march 1st has been left out.